As my son and I have been watching Christmas movies this past week I have noticed he tries to sing along to the songs. Its so very cute! He hums along to the tune and will babble words that sound close to what the song is saying. He really likes Deck the Halls since he can do the "Fa La La La" and Drummer Boy when he cans say "Ba-rump". 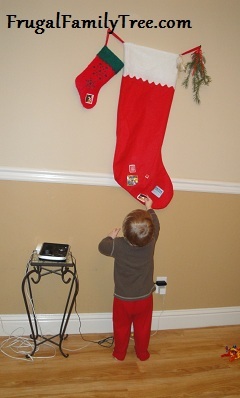 I am really enjoying this Holiday season watching him marvel over the tree, try to help me decorate, he put his stuffed giraffe in the tree and put stickers all over the stockings and how cheerful he gets over Holiday music. When he saw our nativity set he pointed to baby Jesus and said "Baby!" and clapped. It was beyond precious. Seeing the Holiday Season from his perspective brings me a great joy. I can only imagine how fun it is for my own Mom to have seen all us kids enjoy Christmas and now see her grandkids.